The A220 has proved to be a huge hit for Airbus. In fact, it has been selling really well. In fact, just this year we’ve already seen over 130 new A220s ordered by Moxy, Delta, and JetBlue. In fact, according to Airbus figures, up until December 31st, the A220 had already sold 537 units. This is around 10 times the number that have been manufactured. 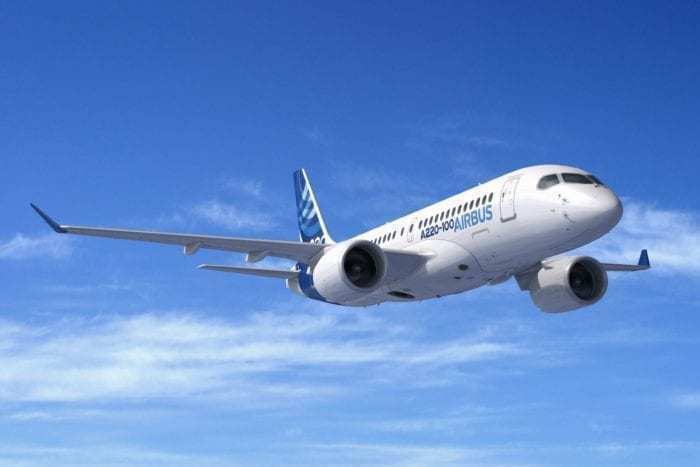 The aircraft was originally known as the Bombardier C Series, however, after Airbus purchased 50.01% of the program, it was renamed to be the Airbus A220. With plenty of capabilities, the aircraft could be perfect for British Airways. The A220 is the largest aircraft which can use London City Airport. 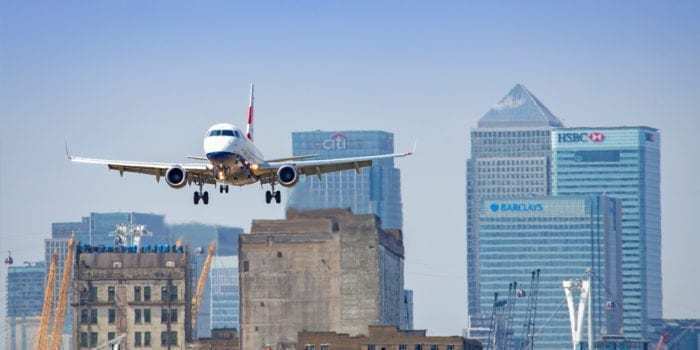 Having such a unique location right in the centre of London, City Airport has a fairly steep approach. This is currently 5.5°, although it used to be 7° when the airport opened. For reference, the standard airport approach is 3°. Tied in with this, London City Airport has a fairly short runway. Compared with London Heathrow’s mammoth runways, City’s runway is only 1,508m. This is less than half of Heathrow’s shortest runway. In fact, British Airways operates a business class only service from London to New York. This service, BA1, stops in Shannon to refuel due to the weight limits of City’s Runway. The flight is completed in an A318 which British Airways maintains just for the flights. With a larger floor area, British Airways could provide even more seats on the route using the aircraft. This is especially true as the aircraft was recently granted ETOPS certification. On quieter, direct international routes, airlines are increasingly turning to long distance narrow-body aircraft. The thinking is, why utilise a half full wide-body when you could fill a narrow-body. In addition to this, while being cheaper to operate as it is taking a lot less fuel to keep the aircraft in the sky. In fact, the A220 would be even cheaper than an A321LR. As such, with its extended range, British Airways could utilise the aircraft for flights originating out of Manchester Airport. The A220 has become so popular that some airlines are switching to it outright. Air Baltic, who Simple Flying reported on last week, is currently working to phase out their older aircraft in favour of the new A220. David Neeleman is currently in the process of launching a brand new airline. Codenamed Moxy, this airline would be operated by a fleet of 60 A220 aircraft. On the same day that they announced his order, Airbus announced that another airline he had founded, JetBlue, had also ordered 60 of the aircraft. Do you think British Airways should purchase the A220? Let us know in the comments down below! Why not? Just saying “no” without qualifying why you came to this conclusion give ZERO credibility to what you say. I know you are not arrogant in just using a one-worded answer, but to some folks, it could appear to be so. Please prove them wrong. For anyone to support your point, you’d need to give reasons why you think that British Airways should not order the A220 . British Airways would ruin it for economy class passengers, as they have ruined their other Airbus aircraft, by fitting uncomfortable seats, with reduced seat pitch, deleting any standard of service, and fitting tiny toilets. It unlikely this route would have any economy class seating. The current aircraft, an A318 (BA1), has only 32 seats. When Bombardier did the certification testing for this route, it simulated having 40 seats. They wouldn’t be able to do tiny toilets, Bombardier made sure of it. The toilets are behind the bulkheads and doors thus the airlines can’t make them smaller to add a row. Yes, but as BA is run by dinosaurs chasing easy money from corporate business passengers I doubt they would have the foresight to order it. Sure. If, and only if, they don’t cram in the kind of seat configuration as they do on the other small Airbus planes, and make the entire experience crappy like the bargain, cut-rate, no-service airlines do. So, sure, stock up on A220’s, but take my advice or go out of business. Thanks to Boeing – Airbus scored a major accomplishment with the acquisition of Bombardier C series. Imagine getting a 737 similar class aircraft at the cost (operating) of a regional jet. I think that BA would be wise to acquire the Airbus A220 to replace its fleet of regional jets and 737. For BA from London city to New York return. Does it have enough range to get to NYC and back without a stop, no point replacing if it can’t outperform the current aircraft? For Manchester long haul does it have the range to get none stop and back to Dubai, NYC, Orlando and Islamabad? I think the answer to all of these is no (it definitely is for Orlando and Islamabad), but it is hard to tell on the map. If it is Yes to any of them, then BA get the A220 on the (new) route ASAP. Otherwise it is not going to work long haul from MAN or LCY to NYC. It may still work on some other routes though. It seems that on paper at least the A220-300 would be larger than the single A318 that BA operates between LCY & JFK, on top of that it is more fuel efficient, has etops 180 rating & is also certified to use LCY – 5° approach, the largest plane currently allowed. It’s also quieter than the A320 family. Please stop saying in fact, over and over again in your articles.. The embraer e2 may also be a great option for British Airways! They already have them ? This article is so Airbus-biased that it’s hardly worthy of comment. If BA want an aircraft of this size and performance, they must perform Due Diligence and look at what else is available. Maybe the Embraer 195-E2? One problem is that at the moment LCY can only handle a maximum of 4 A220s. Once the new stands are built that will increase but BA couldn’t offer as many flights as they do today as it would still only be around 10 stands that could take the A220. When Crossrail is complete there will be very little reason to operate BA1 A318 anymore. BA could furnish up an A220 and make it truly special but it is still going to struggle to attract customers. The Embraer is great now for other routes and should be fine for many years to come.